You know the rest of it: All I get is bony fingers! I'd like to tell you about the inspiration for Styx, the dog in the second Sleuth Sisters book. I've known 2 Newfs well, since my son had one for a while and my brother still does. They're beautiful dogs, and if you read up on them you'll find that they're intelligent, loving, and loyal. So when Styx acts a little goofy in Book #2, it's just his personality, not the breed. Both the Newfs I know became extended family members young, and it was a little difficult for a while, having a puppy as big as a house. 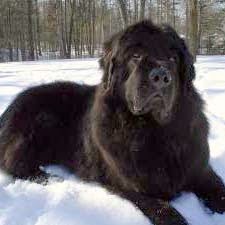 Bubba, the first Newf I "met" was a hole-digger, a drooler, and as sweet as a dog can be. Terra (short for Holy Terror) used to drag my sister-in-law around where SHE wanted to go and paid no attention to commands. Both dogs calmed down with training and as they got past that bratty kid stage. Now Terra can be trusted to do as she's told and doesn't need to be on a leash when we go for walks. At the end of Book #3, the series will gain a third dog (No, not for Barb: she would NEVER!) I'm leaning toward a Black Lab. It helps to have the character in mind as I write, and my favorite dog ever was a Lab. I've had lots of other good suggestions, though. I guess we'll see. Black Lab is a wonderful choice. They are so sweet and loyal!